In a multi-year plan jointly developed with Bentley, Black & Veatch’s Power and Oil and Gas businesses migrated from an in-house, proprietary plant design system to Bentley technology and transformed the company’s processes for engineering, procurement, and construction of power generation and oil and gas projects. Black & Veatch evaluated and modified current processes and procedures across all engineering disciplines and deliverables, trained professionals, and delivered the new methodology on a global scale across 10 design centres and 11 support offices in North America and Asia. One early project success that resulted from this initiative was the Sewaren 7 power plant, now under construction in Woodbridge, New Jersey. The plant will provide 540 megawatts of power to the U.S. states of Pennsylvania, New Jersey, and Maryland using a high-efficiency, H-class combustion turbine. Black & Veatch is designing and constructing this USD 600 million power plant for the Public Service Enterprise Group (PSEG). 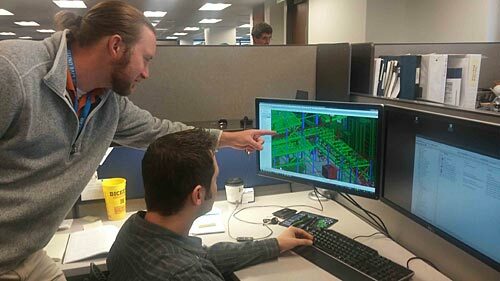 According to Shawn Foster, Black & Veatch commercial technology operations manager, Black & Veatch is using Bentley Navigator for cross-discipline reviews and interference management. The project team is also using AECOsim Building Designer and OpenPlant Modeler to exchange analysis data with various analysis tools including AutoPIPE. 2D data centric applications, such as OpenPlant P&ID and Bentley Instrumentation & Wiring, are being used for system design, intelligent reporting, and equipment design. This improvement allowed project professionals to access accurate, up-to-date information without the need to continuously check with other disciplines for information or to re-enter information already entered in another application. It also enabled the team to create multi-discipline 3D review models for the client and collaborate around design alternatives. Black & Veatch uses ProjectWise as the single source of truth across all projects, connecting all participants to U.S.-based or Asia-based data sources, which are established based on business lines. For the Sewaren 7 project, a single project master model (PMM) and multiple commodity master models (CMM) were created. Sharing the PMM and CMMs among disciplines allowed designers to resolve clashes collaboratively with all portions of the model. Black & Veatch also used i-models as the currency for interdisciplinary sharing and communication. Storing the i-models in ProjectWise ensured that project team members always had access to the most accurate data wherever they were in the world. ProjectWise SDK was also used to create a hybrid environment with key internally developed databases and to share accurate equipment design information in real time among disciplines. The Black & Veatch Power Oil & Gas businesses are now standardised on Bentley technology as its default suite of applications. The organisation can more readily flow data among project phases, from estimating and conceptual design through detailed design and to construction and handover. Using Bentley’s design and collaboration technology, lean processes, and a connected data environment supports Black & Veatch’s continuous improvement efforts to eliminate waste and improve efficiency in project execution globally across all projects.